I stood in the doorway, eyes adjusting to the dim lighting inside. There are no windows but the door stands wide open and shafts of light pierce through the gaps in the tin walls. There’s been a few changes since my last visit. Chequered vinyl lines the concrete floor and the baby is lying on it, happily kicking her feet in the air. The bed has moved and the space looks much bigger. Off to the side is a doorway, leading to a makeshift bathroom, which wasn’t there last time I visited. Some privacy at last for this family. 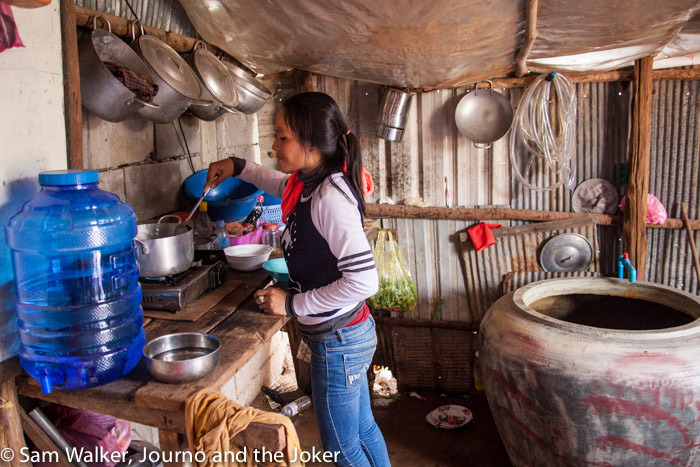 It’s a humble home in a “sidewalk village” — a group of make-shift tin houses and wooden shacks assembled on the side of the road. Chantrea comes to meet me, shy and uncertain, not sure how to proceed with this strange arrangement we have come to. I’m here for a cooking lesson of sorts. Her English is almost non-existent but we communicate in the age-old way of hand signals and body language, with Sothy jumping in to interpret when needed. Sothy is the teacher I have been helping with conversational English classes for the last year. Chantrea is his wife. Despite him being an English teacher, his wife has not picked up the language. I think in part, she is too shy to speak it. But clearly she wants to communicate and to share ideas. So here we are, with a bowl of veggies and some chopped pork, ready to cook, not really knowing how to proceed. Food — it’s such a big part of discovering a new culture and certainly a crucial part of any travel experience. And learning to cook like the locals — or like the experts — is an increasingly popular activity around the world. Cooking classes are in demand as home chefs try and expand their culinary repertoire and impress their family and friends and travellers try to take the flavours they’ve discovered home. There’s certainly no shortage of cooking classes in Siem Reap catering to this need. But in all these set-ups catering to the whims of the masses, the options seem to be fairly limited. 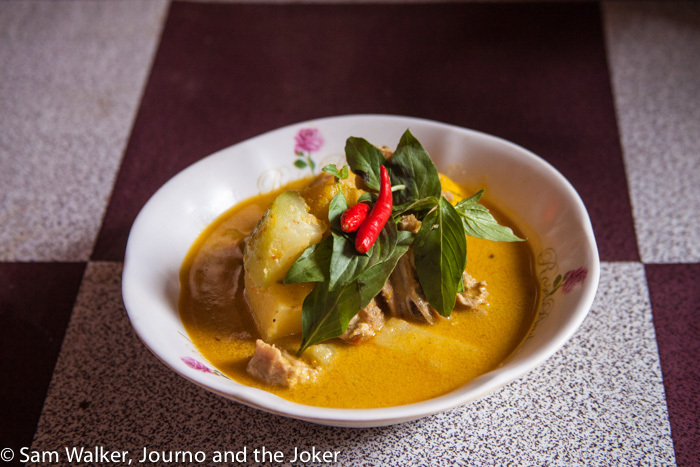 Here in Cambodia you are almost guaranteed to be cooking up the nation’s star dishes — fish amok or beef lok lak and perhaps a green papaya or green mango salad. The thing is, while these are national dishes, they are not the meals eaten in homes every day. They are more likely to be special occasion meals. I wanted to learn the everyday stuff that people cook up in their homes and villages. So Chantrea was catering to my request and invited me to see how she prepares this curry of sorts. It is not a curry. She has made this clear before. It’s some kind of winter melon soup for want of a better description. She has made it before when I visited and it is delicious. It is only now I am learning it has a more Thai influence, stemming from her birthplace near the Thai border. Unsure of the expectation in this lesson, she had already chopped the vegetables and the chicken. So we begin. Me watching as she adds a dash of oil to a large saucepan heated with a camp stove with a single butane gas cylinder. 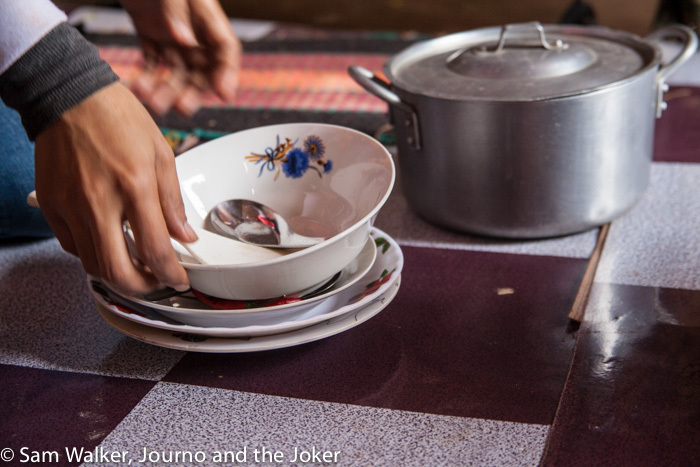 It’s a commonly used stove for many Cambodian families. The next thing I know she is throwing in a large spoonful of fragrant yellow spice mix. “Wait, wait,” I cry. “What is this?” I thought I was going to learn to make the spice mix — it is of course integral to the making of the dish and the flavours that arise. We ascertain that it has lemongrass and I think possibly coconut. Definitely a dash of chilli. But I remain uncertain about the other ingredients. I soon realise you can buy this mix readily at most local markets and this is probably what she has done. So we go on and the pork is added. Then some coconut milk. Fresh, of course. No tinned stuff here. But she just adds a small amount of coconut milk, mixing it through and heating it up. A spoonful of sauce is added and I ask what it is. Trey, I’m told — fish sauce. I don’t like fish and never use fish sauce but I’m aware most dishes here use it and in such small quantities I often can’t taste it. I’ve had this dish before so I know it will be fine. She stirs it through and adds the vegetables. There’s winter melon and pumpkin and one or two I’m unsure of. Then more coconut milk, some sugar and salt — because it’s just not a Cambodian meal without sugar and salt. She tried it and added some more sugar, stirred and tried again. Then she got me to try it. Tasted pretty good. It bubbles and brews away for another five or so minutes before she starts putting bowls and cutlery on the checkered floor. It seems lunch was ready in no time. Rice is spooned into the bowls. The family sits on the floor and I’m asked to sit with them. And we eat this delicious meal together. As far as cooking lessons go, I’m not really much wiser and I probably won’t be able to reproduce this meal at home. But it is a unique experience and a memory I will cherish. Being part of the cooking process, watching, learning and most importantly sharing this meal in this humble but welcoming home. I hope I get the opportunity to reciprocate the experience with Chantrea with a cooking lesson to teach her a western dish in exchange. One of the best travel experiences I had, was a cooking session at the home of a Dogon woman in Mali. I’ve never been able to replicate what we made that day but the experience of being in her kitchen and sharing a little piece of a life that was so far removed from my own was an something I’ll never forget. Yes Nina! Exactly how I felt. What a great blog post, I absolutely loved it! One of my favourite dishes to make is fish amok curry, tedious but the end result is just delish. Thanks for stopping by Bling and Butterflies. I’m so pleased you enjoyed the post. I don’t eat fish, so I haven’t tried the fish amok, although I’ve had chicken amok a few times. I believe it is quite a process to make it correctly. Beautiful story. So often the meals associated with a certain country are not on the menu of everyday people. 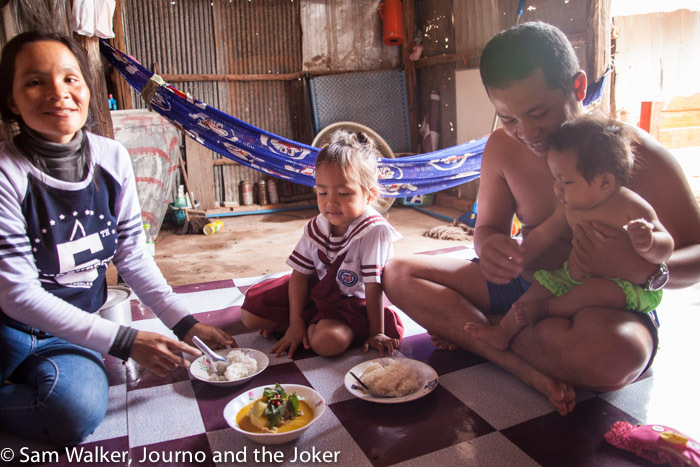 What a fantastic and humbling insight into Cambodian life. Thanks Sally. Yes, very humbling. Cambodians are such beautiful, generous and sharing people. And this simple food was delicious.